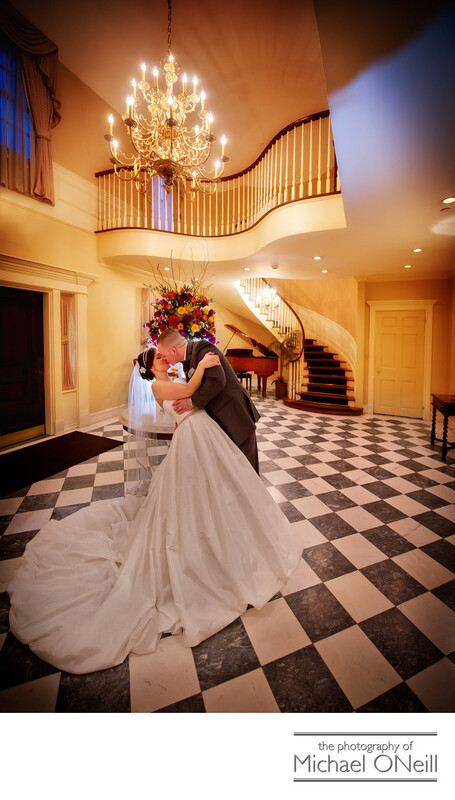 Another image from the amazing Royalton Mansion at the Roslyn Country Club in Nassau County, Long Island. This view is looking across the venue’s elegant lobby towards the signature spiral staircase and grand piano in the background. The balcony above looks down on the lobby from a beautifully appointed upstairs room that is used to cater the cocktail hour portion of your wedding reception. I love working at the Royalton Mansion...probably one of my favorite wedding reception venues anywhere in New York. The building is elegant, it’s grounds are beautiful, the food is exquisite and the service impeccable. The bride in this photograph was the second of two sisters to get married within a year’s time. I had the privilege of photographing her sister’s wedding as well. This is one of the most satisfying things about my job as a wedding photographer: having people enjoy your work and your personality so much that they invite you to be a part of subsequent events in their lives. Though I now have a professional relationship as one of the Royalton’s recommended photographers I didn’t when this picture was taken. My being there this day was all about the relationship I had already developed with the family.